Saturday, the York Revolution held their annual Fan Fest. The York Revolution are the local professional baseball team, part of the Atlantic League, an independent league outside of organized baseball. Players in the Atlantic League have, for want of a better term, “washed out” of the major leagues or their farm systems. Some players may be looking for a shot to prove to scouts that they still have “the stuff”; for these players, the Atlantic League is what NPR’s Neal Conan called “the last chance league” in his book on the league, Play By Play. Other players simply want to continue playing the game because they feel the competitive spirit. The Fan Fest was a day where fans could meet and interact with the players and where the team could put on a party and an exhibition game for the community. Since tickets were cheap — just five dollars for a day of baseball — I bought a ticket and went. The day began with a concert by country music artist Maggie Rose in Brooks Robinson Plaza. Country music is not my thing, as anyone who knows me knows, but she put on a nice show, the audience was certainly receptive, and she did a lovely job on the Star-Spangled Banner. There was a good crowd for the game, over three thousand people, according to Sunday’s newspaper. It was an enthusiastic crowd. The ballplayers mingled with the crowd, having their pictures taken and signing autographs. Inside the stadium’s concourse there were vendors and auctions. I tried the pretzel dogs from one of the vendors (very good), then went to the team store where I bought a baseball cap for myself (it’s yellow) and a plush of the team’s mascot Downtown for my niece. Then I settled in to watch the game. The game, by the way, was no ordinary game. The York Revolution would be playing this day the Atlantic League Alumni All-Stars. This was a team comprised of former Atlantic League players. Not necessarily for York, there were players representing almost every team in the league’s history. These were players who were, in some cases, several years removed from the last professional game of their careers, and they were invited back for this one game. Their skills were rusty, the easy teamwork wasn’t always there, but they gave it their best. I’m hesitant to criticize the play of the Atlantic League Alumni All-Stars because it would be churlish to do so. This team of fourteen may not have been at the pinnacle of their careers, but even rusty they were far better ballplayers than I would ever have been. The second inning was the roughest for the All-Stars’ starting pitcher, Wayne Franklin. He had some difficulty finding the plate, he walked the bases full, he gave up a grand slam. At one point I noted that York had scored 8 runs on only 3 hits; in addition to the walks Franklin gave up, the fielders behind him had committed three errors. Eventually, they simply ended the second inning. The Revolution had plated seven runs in the inning, they had runners on second and third, and there was only one out on the board. York’s manager, Mike Mason, came out, talked to the umpire, and the inning was over. On to the third we went. After that, the game settled down. York scored runs here and there. The All-Stars warmed up pitchers, subbed in a few players, let other players try out different positions in the field. Around the sixth inning, I went for a walk around the ballpark. I wanted to see more of Sovereign Bank Stadium. There was a playground area beyond the center field wall, and I walked behind the Arch Nemesis, the wall in left field that is six inches taller than the Green Monster in Fenway Park. Going in to the top of the ninth, the score was 12-2. The All-Stars sent three men to the plate. Three quick outs were recorded. The victory cannon fired. The crowd began to leave. York sent a man up to the plate to bat in the bottom of the ninth. 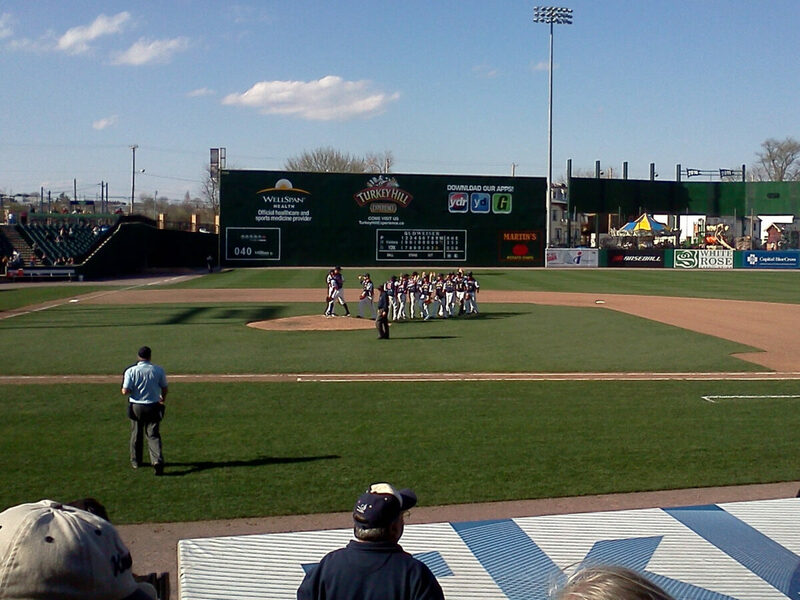 And the All-Stars ran out to take the field once more even though, by rights, York had the game won. I realized what they’d done. And I thought it was a lovely gesture. For the purposes of this game, they treated the ninth inning as though the All-Stars were up by one or two runs, not down by ten. York batted last as if they were down, even though by rights they had the game won. And the All-Stars, when the last out was recorded, celebrated on the field as if they had won. I don’t think the fans who stayed to the end quite understood. There was a boy who sat behind me who asked one of the adults he was with why I was applauding for the Atlantic League Alumni All-Stars, and the adult replied, “Well, maybe he’s here for the other team.” I wasn’t, any more than I was there for the Revs; I don’t know these players, I didn’t live and die with them, but even this team of All-Stars needed someone to clap for them when they made a good play, when they struck out a batter, when they drove in a run. It was respect as much as it was appreciation. And an acknowledgement of their dreams.